Roasting is a dry-heat cooking method that utilizes the natural juices in meats such as poultry, beef, pork and ham. Electric roaster ovens make the most of this feature by cooking foods through the even distribution of heat and liquids. Because the covered roaster traps and recycles moisture from the food as it cooks, no additional water or other liquids are needed unless called for in a recipe. Adding water to the bottom of the roaster oven before cooking defeats the purpose of the unit, as its function is to roast, not steam, the food. 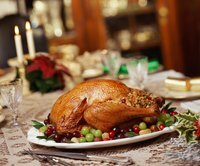 Additional moisture may prevent the skin on a turkey, goose or large chicken from browning and crisping, and any natural flavors present in the meat juices may be reduced through dilution. During cooking, juices released by the bird or roast drip to the bottom of the cooking pan and are recycled as they travel up and around during the evaporation process. Roasting ovens generally come as 18- or 22-quart units that can accommodate up to a 20-pound turkey or a large beef or pork roast or ham. The high-domed lid on most models provides extra space at the top for oddly shaped cuts of meat, and some units include a removable rack that keeps the meat off the bottom. The temperature range for most roaster ovens is roughly 150 to 450 degrees Fahrenheit, and the heating elements on most units is built into the outer walls so that heat comes at the meat from the sides and not just the bottom. All roaster ovens are accompanied by a detailed owner's manual that provides all the information necessary to the proper usage and maintenance of the unit. This includes recipes designed specifically for the oven, and following them assures the best results. Unless otherwise specified, preheat the roaster oven to the temperature required by the recipe, and add the poultry or roast and any seasonings and fats, such as salt, pepper, butter or oil as instructed in the recipe, and no other liquids. Place the lid on the roaster and cook for the required time. Use an instant-read meat thermometer to be sure the roast or turkey has reached a safe internal temperature. For beef, pork and ham, look for a reading of at least 145 degrees Fahrenheit, and a temperature of at least 165 F for turkey and chicken. All electric roasting ovens work for many other types of cooking, including baking cakes and casseroles, making soups and steaming foods. Steaming foods such as vegetables requires the addition of water and the use of a separate steaming unit, such as a metal basket or large colander. In this case, follow the directions as to the amount of water needed before steaming the foods. And as with all other roaster oven uses, remove the cooked foods carefully using the rack, or wear oven mitts to remove hot steamed foods. OChef: Must You Add Water to a Roaster Oven? The Review Squad: Electric Roaster Oven Reviews.